Morocco is a beautiful and diverse country. In one day you will be able to ride a camel in the Sahara and snowboard in the Atlas Mountains. It is a large country and easy to travel although, the distance can be quite long. Therefore, creating the perfect Morocco route can be difficult. 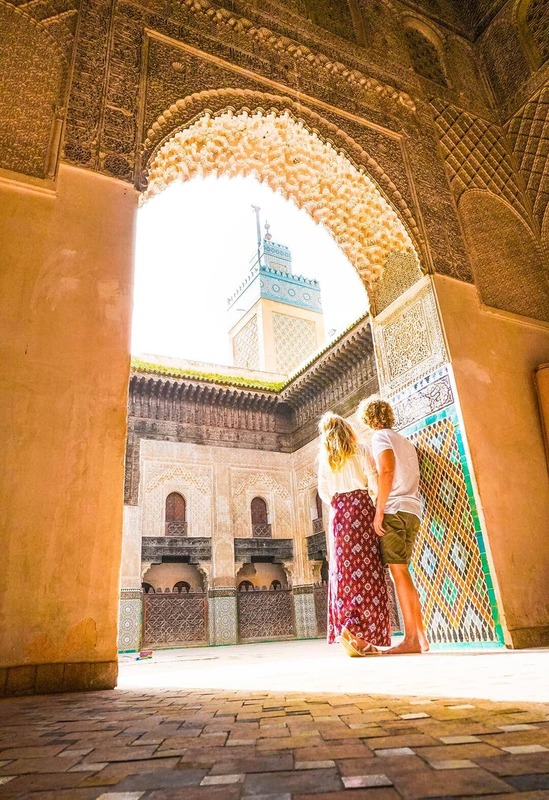 Our 10-day route through Morocco was an incredible trip which gave us the opportunity to see the highlights of this country. 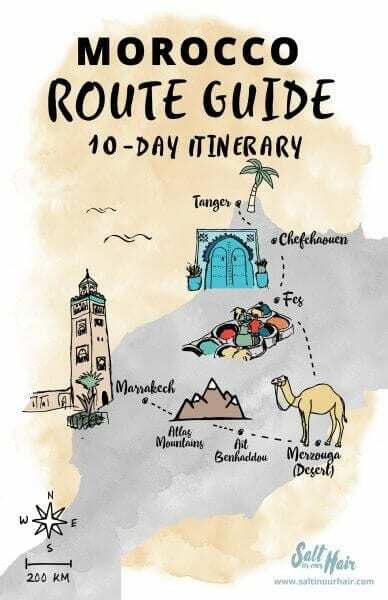 Our 10-day route was starting from Chefchaouen, but you can easily do this the other way round. 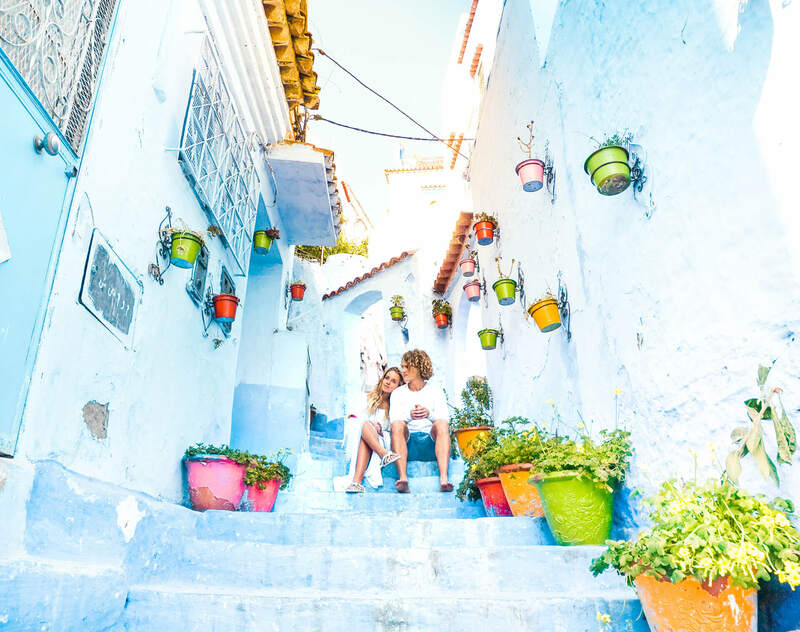 If you have the time, we would recommend extending the itinerary to 12 days instead of 10 to have one more day for each Chefchaouen, The blue city of Morocco and the Sahara Desert Tour. The nearest airport to Chefchaouen is Tangier Airport. From Tangier, it’s a 2-hour drive with the taxi or a 4-hour drive with the CTM bus. The bus costs around 50 DH which cost a little less than 5 dollars. From the airport, take a taxi to the gare routière (bus station) 1.5 km. All buses including CTM will leave from here. You can also split a taxi with others and pay around $15 each, which saves you 2 hours driving time. 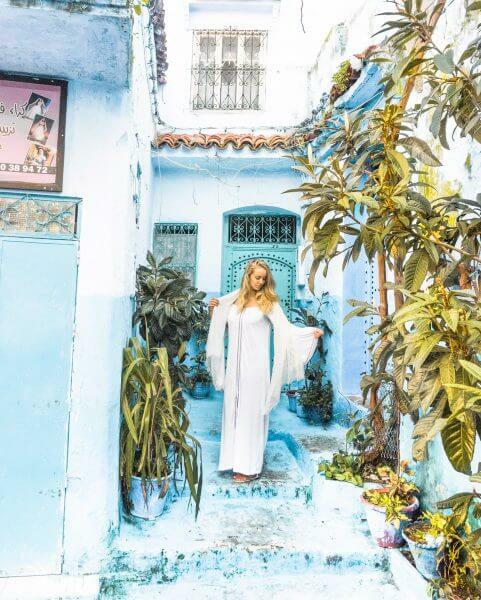 Chefchaouen is the one place you shouldn’t skip while creating your Morocco route. It’s a mountain village painted in 100 shades of blue. Every corner has its own kind of blue. Spent one extra day in this city if you are able to. Fes is a city where you won’t get bored that easily. There is a lot to do in and around Fes. It has one of the oldest medinas and surprisingly non-touristy city because it’s not on most people their Morocco route. Merzouga is a town on the edge of the Sahara Desert in Morocco. From here, it is a 45-minute drive to the camp where you will be staying for the night. 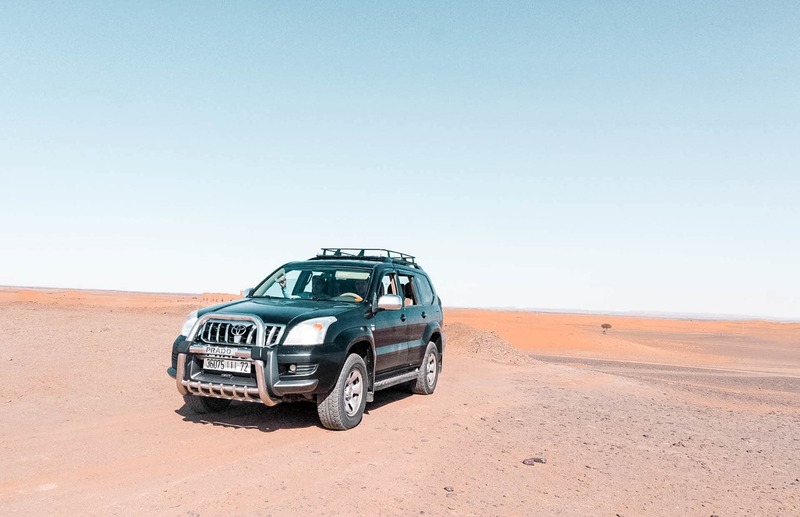 It is best to do a 3-day Sahara Desert Tour from Fes to Marrakech. From Fes to Merzouga is a 5-hour drive through beautiful landscapes and snow covering the Atlas Mountains. You will be woken up early after a great evening with music and dinner to see the sunrise on the back of a camel in the Sahara Desert. After sunrise, breakfast is served and you will be getting back in the car again to carry on our 10-day Morocco route. Heading to Boumalne Dades as your place to sleep on your way to Marrakech. You will visit a lot of sights on your way to Boumalne Dades. 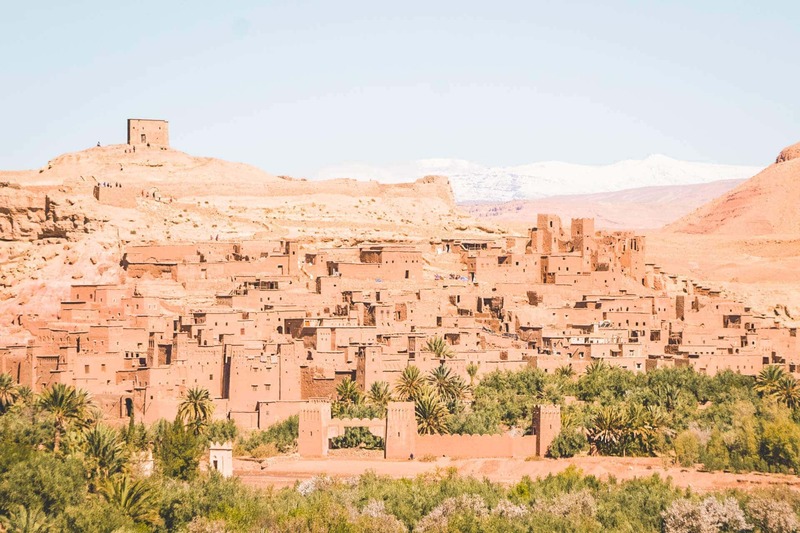 We highly recommend staying in this beautiful Kasbah. The people living here were so super kind for us. These are the Kasbah’s prices. 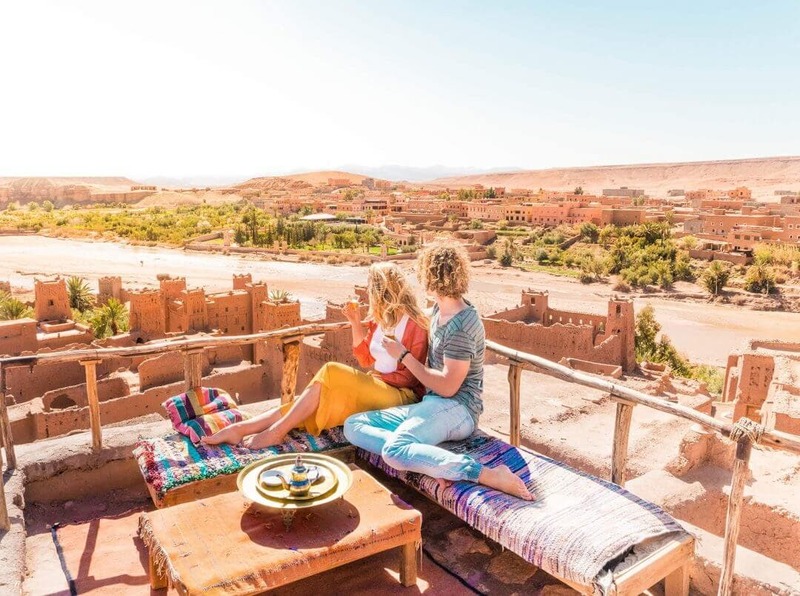 On the last day of the tour, you will be visiting Ait Benhaddou and visiting one of the highest points in the Atlas mountains. The views from up here are spectacular. By the end of the day, you will arrive in Marrakech, probably ready to dip in a pool. So make sure to have a great riad in Marrakech. Marrakech is a great city to end your trip through Morocco. 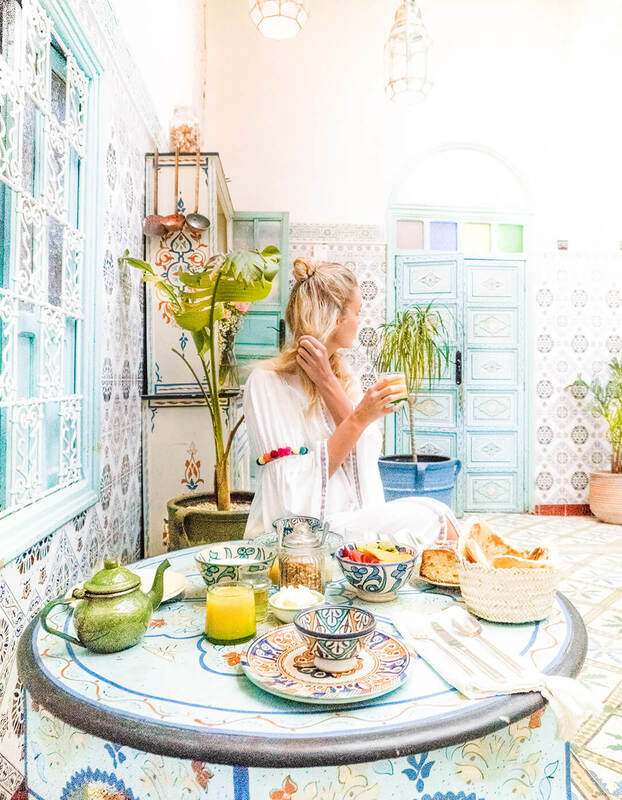 Wander around through the Medina, buy some souvenirs, stay in the most beautiful riads (guesthouses) and visit all the beautiful colored buildings. The trip is over, having your last delicious Moroccan breakfast and flying home from Marrakech International airport. Is Morocco safe to travel? Yes!! Morocco is completely safe as a country to travel. People are friendly and will let you know when they don’t want you to take a picture with them in it. At night, make sure to not walk alone and stay in the city center (medina) just to be sure. Is Morocco safe to travel for a woman alone? Also a yes, it is safe but keep in mind that this is a Muslim country and guys are not really used to ‘western’ girls. Blonde hair will draw a lot of attention, probably more than you like. It’s helpful to wear clothes that cover up your shape a little, so no shorts or mini skirts for example. And always take an extra scarf with you. So yes it is safe to travel through Morocco as a woman alone but it’s always safer to travel together with someone else. Travelling Morocco can be as cheap or expensive as you like it to be. 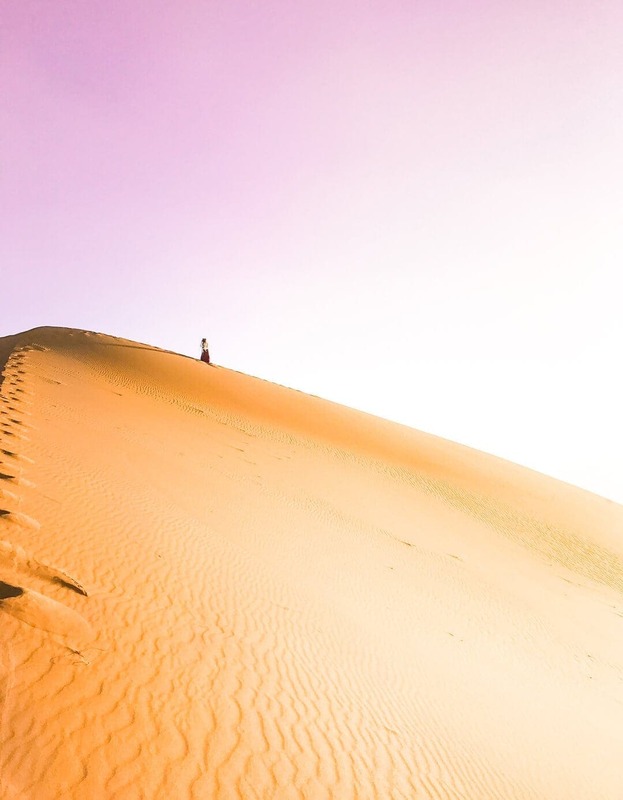 A group tour to the Sahara will cost around $150 and private more around $600. Trains and buses are very cheap, where taxis can get pricey very fast. Food costs anywhere from $2 to $12, fresh orange juice $0.5 to $3. Airbnb riads can be pretty cheap to stay in, $30 a night where the riads from Booking.com can be doubled easily. We would recommend avoiding Morocco in July and August. I can get unpleasantly hot in the cities. We visit in February and we needed a little jacket for a few days, which was a perfect climate for us. The country is at its most beautiful from March to May when the landscape, or during Autumn (September to October) when temperatures are very pleasant. Morocco was the first time we vlogged our trip. Make sure to check out our all of our Morocco vlogs! Riads in Morocco are incredible, these were our favorites. Find all riads in Marrakech.